Drug Store and High street makeup have always been a favourite of mine. When I was younger I used to save up to be able to buy a new lipstick or eyeliner and still to this day I love finding an amazing product for an also great price. I've decided to start a new series on my blog for 5 products that I love for under £5 to help you find amazing products for an even better price! I actually found it slightly difficult to put this list together because a lot of the concealers I have are over the £5 mark. 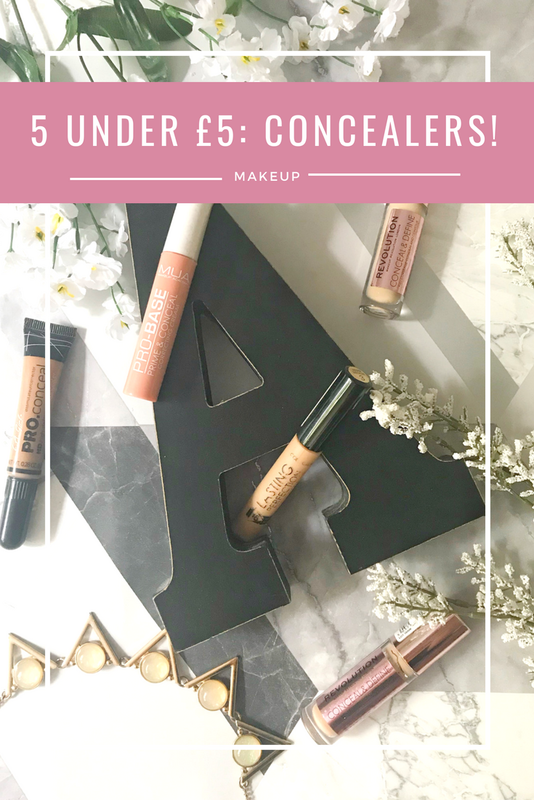 I have thought about this list for a long time to make sure that all the products listed meet my high criteria for a great but inexpensive concealer! 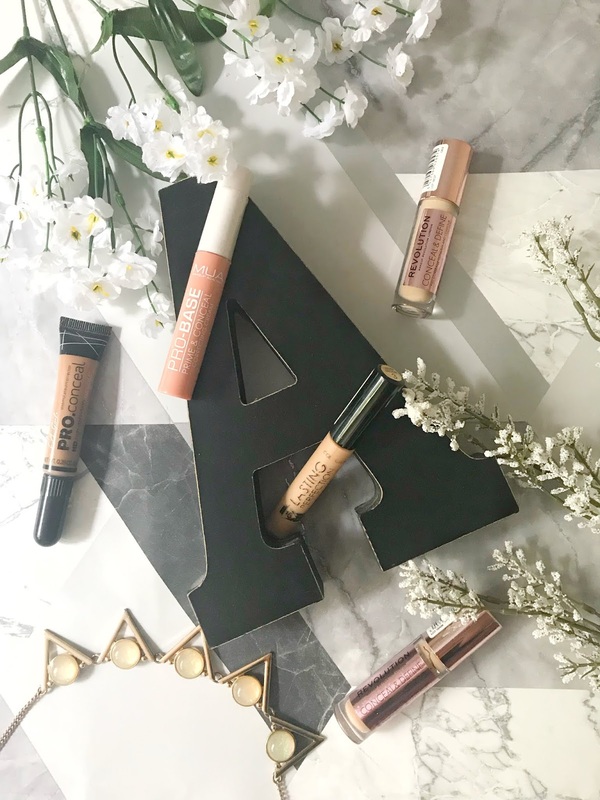 I have put this concealer in the number one place because since I reviewed it in my Testing: Revolution Beauty Conceal & Define post I have been using ever since! Its a ticker consistency making it perfect for concealing imperfections and also if you're using it for contouring. I have two shades of this concealer, C8 which is the perfect shade for my skin tone and C8.5 which is slightly lighter than my skin tone making it perfect for highlighting. Another reason why I've added this concealer to my list is that it has an amazing shade range, there should be a shade to suit everyone's skin tone. In this concealer, you do get slightly less product at 4ml than other concealers which are usually 5ml or more but for the £4 price tag you can't go wrong. For a concealer that is less than £5, it is amazing quality and I would recommend everyone giving it a go! Now I know that this mightly slightly be cheating because this is the same product before but I have my reasons. Like I said before I have different colours of this concealer for different uses, the lighter concealer that I have which is C8.5 I use for highlighting. This concealer is perfect for cream highlighting certain areas of the face if you are contouring. You can also add a darker shade of this concealer to contour certain areas of your face. When highlighting I like to use this concealer on the bridge of my nose, my cupids bow and also my slightly above my cheekbones. The bigger doe foot applicator makes it perfect for highlighting and contour larger areas of the face like the forehead and jawline. To blend in this concealer I like to either use my finger or a damp beauty blender for the product to look beautifully blended. This concealer has always been a favourite of mine. For only £4.19 you get an amazing quality concealer that I like to use to conceal imperfections mostly. This concealer has a small doe foot applicator which makes it perfect for concealing small areas of spots or around the nose. The consistency of this concealer is slightly thick and can try quickly so I like apply and them blend each area of my face separately. I found that the best way to blend out this concealer is either using your finger or a damp sponge. Collection has recently released more shades of this concealer that I was very happy about so more people with darker skin tones can start using this concealer. This concealer also comes in corrective colours like green, peach and lilac to help colour correct the skin if needed. For the small price tag, you get a very generous amount of product which lasts a long time so that's definitely a bonus. This is the only colour corrector that I've added on this list because most of the ones that I own are over the £5 mark and are actually not as good as this one. I used to find it difficult to actually find the right colour corrector for me that blends easily and still cancels out the imperfection until I discovered this colour corrector. The price of this product is amazing at only £3 you get a great quality product that really works at colour correcting. The colour I have is the peach one which neutralises dark circles but they also have green which cancels out redness and yellow which brightens purple undertones. I like to use this product under my eyes before I apply my foundation and concealer to really hide my dark circles! This is a concealer that Youtube made me buy, I watched so many different videos saying how great of a concealer that this one is and had to get it straight away. The colour that I have at the moment is actually too dark for me so I use it most for contouring, It works really well because it blends out like a dream with any type of foundation underneath. When I had my correct colour it is also a great concealer for concealing redness and areas of concern because of its thick consistency. I use this concealer a lot when I have a major breakout to cover everything nicely. What I also really like about this concealer is the shade range it has 28 shades and also includes 5 colour correcting shades. This concealer also has a white shade which can be used as a highlighter or mixed with another colour to make it a lighter shade. I am planing on making posts like this a series to show that you can get some really great products all for a great price! Have you tried any of these concealers before? Love these! I'll check them out, thanks for sharing. I love the Collection concealer, I've used it for years and don't think I'll ever stop buying it! I must try the others that you've mentioned! The revolution concealer will 100% always be my fave! 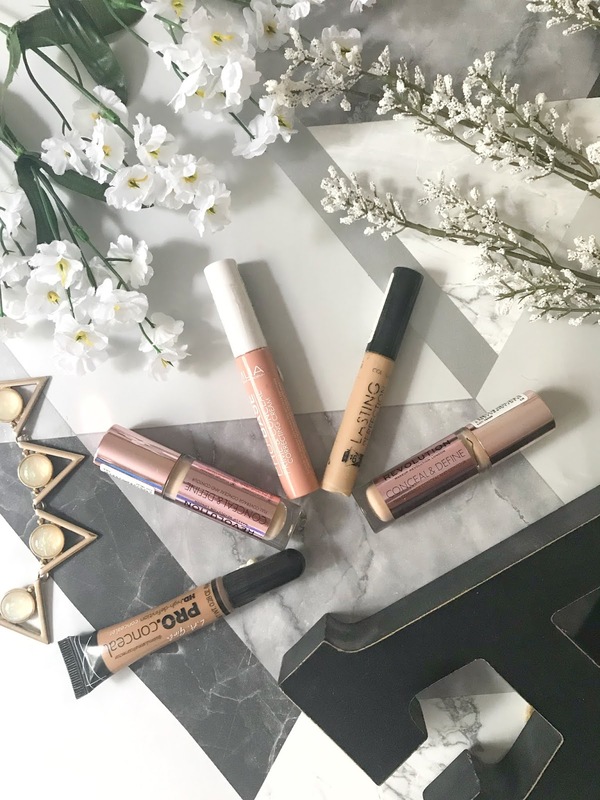 This post couldn't have come at a better time for me, as I'm just about to finish up my current concealer! I keep hearing such great things about the Revolution one! Thanks so much for sharing! The Collection one used to be my go to but I found it made my skin break out so the MR one is my absolute saviour now! I sometimes don't even feel like I have to wear foundation with it as it's that good, just set it with some powder and good to go. I haven't yet tried the LA girl or the MUA ones but I'm very intrigued now. Love this post idea! Concealers are such an important part of a makeup routine. Whats In My July Birchbox! Pink Products Perfect For Summer! Products Im Still Using From My Birchboxes!